“Those (refrigerators) heat up, (samples) die. You can lose your sample if things don’t work properly,” said Phil Baird, former vice president of operations at the American Type Culture Collection (ATCC). At Harvard’s McLean Hospital in 2012, that’s exactly what happened. 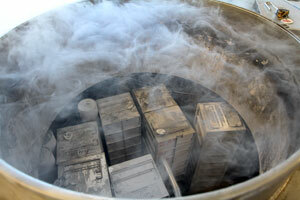 When freezers shut down at the hospital without triggering alarms, 150 brain samples, banked to study autism, decayed. With a background in mechanical engineering and metallurgy and material science, Baird never imagined he would land a job at ATCC. But when he was looking for a job in Washington, D.C., years ago, he came across a job ad for ATCC looking for a candidate with no biology background. That’s how Baird became program director, reporting to ATCC’s chief executive officer, eventually working his way up to VP of operations. “I was (at ATCC) for four years. I spent seven years at Fisher Bioservices (formerly McKesson Bioservices) as VP of the Government Services Division. Here I was responsible for the operation of a number of government funded drug and biological repositories,” Baird said. The positions allowed him the opportunity to work on the Center for Disease Control and Prevention’s Center for Addiction Services and Psychotherapy Interventions Research (CASPIR) as well as run ATCC’s repository, preservation and media labs and other facilities. What Baird’s background in electronics engineering afforded the ATCC was someone who was able focused on infrastructure, design, planning and more. And today, as a consultant, Baird continues to think about these things. Along with Elaine Gunter, owner of Specimen Solutions, LLC, he drafted a two-part publication for Journal of Biopreservation and Biobanking, titled “Repository Planning, Design and Engineering.” Part I looks at infrastructure, while Part II investigates equipment and costing. “A repository may be ‘just a warehouse,’ but the necessary support and control systems make it a very upscale and expensive warehouse. Costs will vary widely depending on the location and purpose of the repository,” Baird and Gunter, both founding members of the International Society of Biological and Environmental Repositories (ISBER), write in Part II on equipment and costing. Now retired, Baird has taken to consulting. While the collection of specimens for research is important, he said it’s important to think about sustainability of the collection or bank while staying within budget. Baird said one of the biggest challenges in his work is to get scientists to begin thinking about the necessary infrastructure for specimen and sample management. He stresses the importance of repositories not only functioning properly but for data management to be accurate and up to date. actually the Maclean autism bank did have proper redundant, separate temperature monitoring systems. But whatever electrical glitch affected the internal workings of the freezer, also disrupted the redundant temp monitor. Now they have 3 independent monitoring systems.